Brighton jewelry is built on attention to detail. In-house designers sketch their creations by hand and follow the concept from start to finish, an idea that is almost unheard of. While Brighton does not have an outlet that sells nothing but jewelry, they do have a few brand outlets that allows you to get their jewelry - and other items - significantly below retail prices. Brighton has over over 5,000 retail locations, five of which are their brand outlet stores. Instead of paying full price for your favorite Brighton jewelry, shop at one of their outlets and discover the savings. The Brighton outlets are scattered across the country. Brighton ships new merchandise to their outlets on the first day of each month. This new merchandise is discounted 30 percent off retail. Each month that the merchandise remains at an outlet, it gets discounted a further 10 percent. On the third Friday of every month, the outlets host a three-day shopping extravaganza that features special clearance pricing on select items. Zappos.com carries many different Brighton accessories. While jewelry is not always available, stock changes frequently so it is worth looking here. Zappos sells below retail on many items, and offers free shipping on all purchases. Cutter & Buck carries several different jewelry items made by Brighton, including watches and bracelets. Most items are discounted roughly 30 percent; some may be marked down more or less. 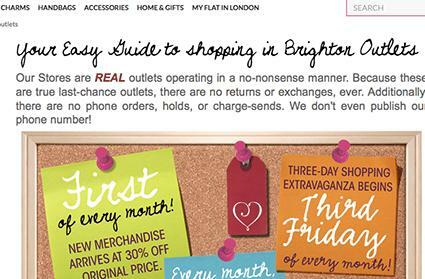 Brighton retail stores and the Brighton website may sometimes offer sales on select items. You'll need to be diligent in looking for bargains, though. The website does not have a "sale" page; you will have to check in frequently to look for price fluctuations. Collecting jewelry from Brighton can be fulfilling and exciting experience, especially if you can find pieces at bargain prices. Once you shop the line and experience the quality, you're bound to fall in love with this company's romantic style. Look for their jewelry at outlet stores and online to get better pricing on the quality and style you're after at a price you can afford.